Argentine ants plus their egg capsules! How will the treatment be carried out? The Exopest technician will first assess the property to plan the best way to control the ants. Depending on building design treatment will involve the roof, subfloor space, perimeter, patios and garden beds. Dusts, sprays, granules and ant baits/cafes are some of the formulations used in ant control. Internal treatment usually involves light spot spraying to skirting boards etc where ants are trailing and dusting cracks/crevices etc. Sometimes entry points are around tap fittings and kitchen work bench tops. Ant Cafes have proved very successful in the last few years where with just a few mls of bait we have controlled the entire nest. Every effort is made to locate and destroy the nest. Exopest use the latest Ant products from BASF, FMC & BAYER inside your home where often only a few litres of spray can often control the ant nest. Sustainable pest management targeting specific areas with minimal chemical! What if it rains soon after treatment? Normally rain is not a problem. The residual dust placed in roofs and cavities is very effective on its own and is often enough to control the infestation. The liquid spray treatment is a residual and crystallises with the soil or on pavements and paths shortly after application, it then remains water resistant. We may choose to use some ant granules to external areas, which do require water to activate the pesticide. Ant granules are often used when raining at the time of treatment or rain is expected. Exopest use the latest residual ant sprays like “Termidor” from BASF containing transfer agents that can kill the entire colony and have many months resudual. 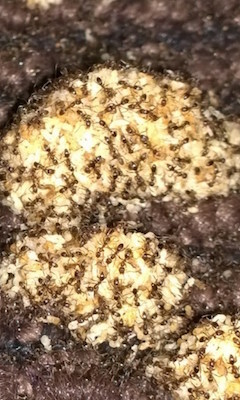 What do I do if ants appear inside after Treatment? The Exopest technician will supply and install ant cafés containing liquid ant bait (3 – 6 ml) inside the building. If ants re-appear then simply shift the ant café close to the trail and they should diminish within 1-2 weeks. The bait is very effective and targets the destruction of nests. The bait is clear and odour free ideal for use in sensitive indoor areas. It can also be placed in strategic areas externally. When should the ants start dying? You may see ants die soon after they come into contact with the treatment. Many die as a result of Exopest directly spraying the ants on the day. However, it may take up to 3 weeks to gain full control. It is impossible to rid your whole property of all ants and you should expect to see some come and go in and around the building after the treatment. They can walk 20-30ft before dying; our aim is to keep them under control inside. When do I call the Pest Control Technician back? Call us if you have ongoing ants problems inside, but please allow 3 weeks from when each treatment or visit is carried out, as the application takes time to work. It may only be the ant bait needs refilling. How often should I have my home treated? Good question. Ants are very unpredictable. Reinfestation will depend on location, state of repair and weather conditions. Many of our clients have their home treated each year as a knock down treatment and as a management tool for ants. Remember we cannot eradicate nature and a few ants will always be seen in around your property.